Allows that we are let into this wonder. 2014: Here I have lived for over twenty years now, eighteen of them in this house above the river at Taghum, which is Chinook jargon for six, as this area begins six miles west of Nelson, BC. The Kootenay flows into the Columbia down-river from here at Castlegar, after having come down out of the Canadian Rockies, then into Montana, Idaho, and back up to BC into Kootenay Lake at Creston. Then it flows out of the West Arm of the lake at Nelson, east of here. She follows the valleys below heavily forested mountains often shrouded in fog and clouds, in winter covered in snow. In the fall these hills garb themselves in a stunning array of colours. I see the river directly below me from the house—everyday this wondrous sight. There is a dam to the west, down-river, so the water is like a lake here, covering what the indigenous peoples would have known as the river shores. 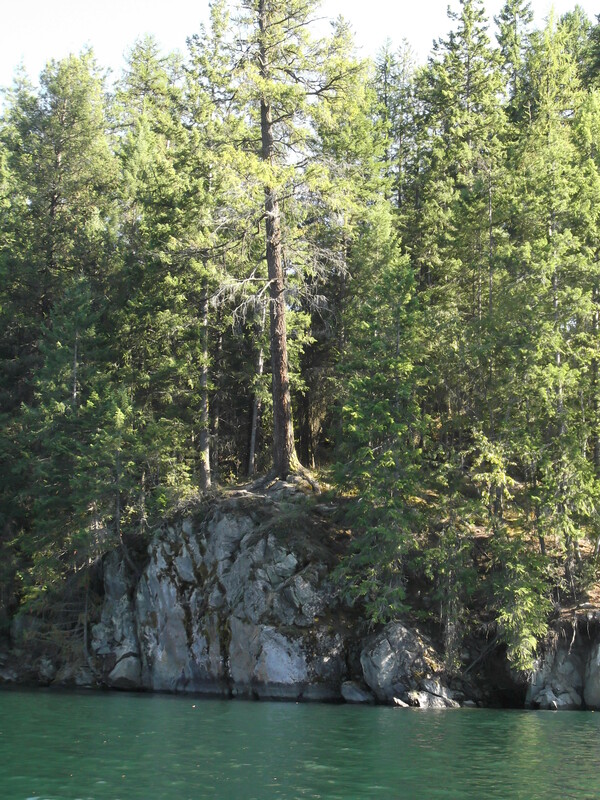 This area was the eastern part of territory inhabited by the Sinixt peoples and the western edge of that inhabited by the Ktunaxa (Kootenay). They canoed the rivers and lakes extensively, and traded with different groups. The Sinixt lived in pit houses, fished, hunted, gathered plant foods, roots and berries, and like the Ktunaxa have been in this region for at least 12,000 years. The language of the Ktunaxa peoples may be related to more eastern groups, or it may have affinity with the Nahuatl language of Central America. One idea is that no related language has been found. The Sinixt spoke an Interior Salish language, and were known as peaceful peoples who often settled disputes between other bands. Sadly, most of the traditional village sites of the Sinixt were flooded when the dam was put in below Arrow Lakes; and the Canadian government declared the group “extinct” even though those who live in WA State are part of the Colville Conferderated Tribes, with all the benefits that entails: Indain status, land, income and others. Before all the Columbia and Kootenay dams one could travel by land and boat all the way from Creston to Astoria, Oregon. In the Columbia Gorge there was a stretch where one had to go by boat, and Celilo Falls was the hardest place for boats. The dams ruined vast rich farming valley and runs for thousands of salmon. At Kettle Falls WA, just past where the Kettle River flows into the Columbia, the Native peoples caught 1600 salmon a day during the runs in July. Bands came from a radius of 500 miles to camp there and the salmon were distributed. The women distributed them, as they were trusted to do it fairly. Then Coulee Dam was built and a way of life crushed. I have spent about 42 of my 70 years living in the Columbia River watershed. 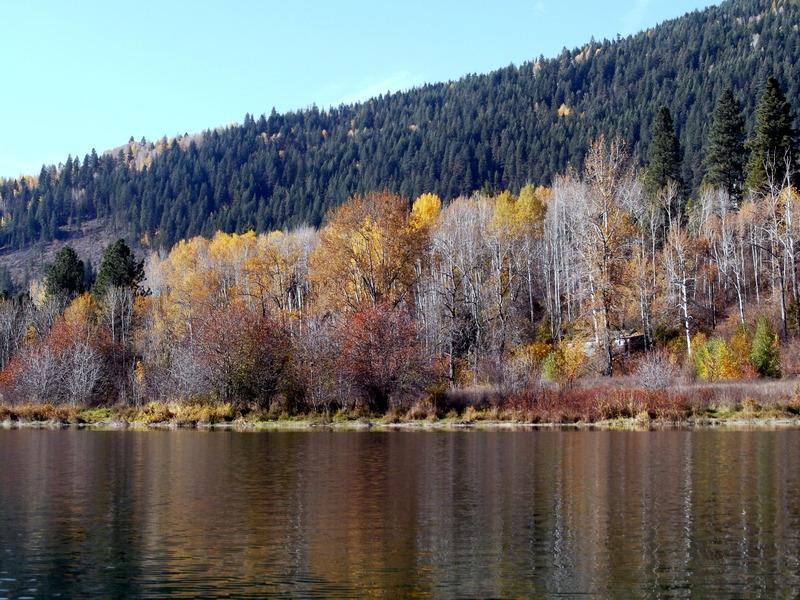 The Columbia Basin includes the Columbia and Kootenay rivers, and the Clark Fork, Snake, and Pend Oreille. These regions are now inhabited by about seven million people. In my early childhood we lived in Yakima WA, my Dad’s hometown. Then I lived in Portland OR, as a college student. For 20 years my home was in the area around Colville, in NE WA State, and now these twenty years here. As a girl in Yakima, when we would go to the lower valley, where the reservation was, I was very impressed with the sight of the tipis set up for a gathering. This instilled in me a longing that lasted for many decades, to have lived several hundred years ago on this Turtle Island and known the ways of the indigenous peoples. In the late 1800’s mining brought people to this part of BC. Then there was logging, some farming. Immigrants included the Doukhobors, a Christian pacifist group who came in the early 1900’s to escape persecution in Russia, aided in this by some Quakers and by Leo Tolstoy. They created nearly 80 communal villages in the region. In the 1970’s the greater area here experienced and influx of young men and women coming to Canada from the US due to that country’s involvement in Viet Nam and the draft. Some of these folks, along with Canadians, were part of the back-to-the land movement, as was I south of here in Washington. In the middle of the last century a Quaker community sprang up on the east shore of Kootenay Lake. In 1963 Swami Sivananda Radha established the Yasodhara Ashram also on that shore. The group she started there has a lineage of women leaders. The inspiring and beautiful temple there recently burned down, and I am sure they will be able to raise enough money to replace it. Nelson grew to become a university town but in the 1980’s the slump in logging brought a slowing of the economy. People left. Then tourism, which included hiking, climbing, skiing, boating, camping, sight-seeing, came in vogue. The town emphasized its history, and heritage buildings were preserved and highlighted. The town and the area became one that attracted artists, writers, theatre people, musicians, and creative folks who began their own businesses. It is a place where quite a few social and ecological activists have been welcome. There is a vibrant cultural scene and a co-op food store which does well. We also have in the area, I would venture to guess, the most dance leaders of the Dances of Universal Peace per capita of anywhere. The area is called the West Kootenays, with the East Kootenays to the east, below the mountains that lead into the Rockies; to the west is the Boundary and Kettle river district. In the larger area there are quite a few natural hot springs, as well as great places for a great variety of outdoor activities. As Nelson has been known as a place where activists and rebels thrive, it has also acquired a strong LGBTQ community. Same-gendered couples are comfortable showing affection in public. As the AIDS epidemic grew, some who had the diagnosis moved to this area to be around accepting folks. Then more recently the area has a good share of transgendered people. Many in the LGBTQ community are great contributors to the arts and to ecological and social justice causes here. This region is within the the only inland rainforest in the world, with a rich ecology. Among those who live in my neighborhood are deer, elk, black bear, raccoon, skunk, squirrel, coyote, beaver, otter, marmot, wild turkey, grouse, pileated woodpecker, bats, stellar’s jay, flicker, bald eagle, osprey, duck, raven, Great Blue Heron, sparrow, owls, hummingbirds, many songbirds, garter snakes, salamander, turtles, snails, slugs, voles, mice and loads of insects, including crickets and ticks. Often I hear the voices of songbirds, ravens and geese, and at night I love to hear crickets and the howls of coyotes, especially the pups. Canada geese inhabit the river shores, and trumpeter swans and loons visit in spring. We have wild strawberries, saskatoon berries, thimble berries, hawthorn and elderberry bushes, chokecherry, huckleberry, Oregon grape, mullein, burdock, chicory, red clover, trillium, honeysuckle, yarrow, tiger lily, grasses, fir, pine, birch, larch, alder, cedar, and cottonwood. There are dogwood here, and this is a protected species; its flower is the official flower of BC. One recent summer after being at the river I met a fellow sitting not far from the tracks. I greeted him and learned he had walked all the way from Nelson. As a bow-maker, he liked to work with yew, so had taken a branch from a tree there. From ancient times in Britain bows and dagger handles were made from yew, and all over Europe the yew was known as the death tree; it was sacred to Hecate in Greece and Italy. On my place there were three willow trees; one fell to Earth, and one is so big and so high that it is an ecosystem of its own. 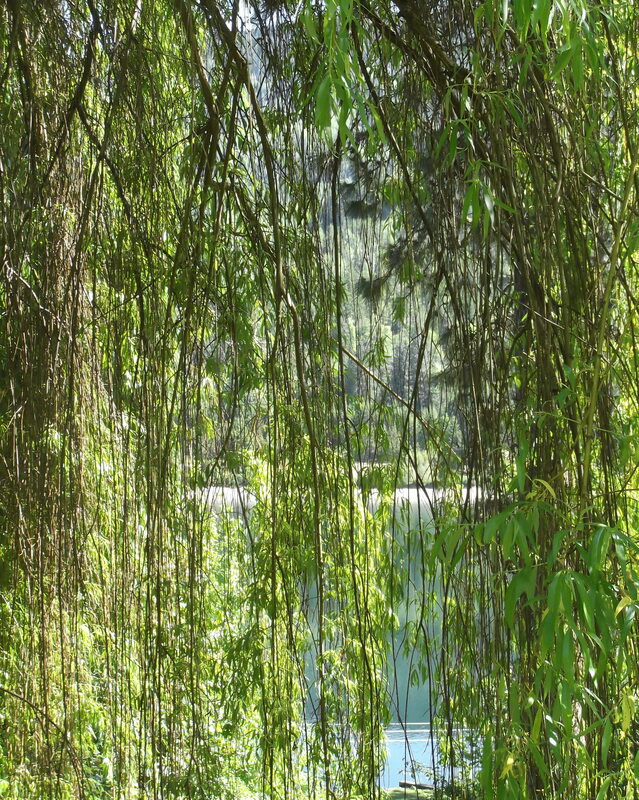 In ancient times the willow was sacred to the moon, to Hecate, to poets, and in wiccan traditions. 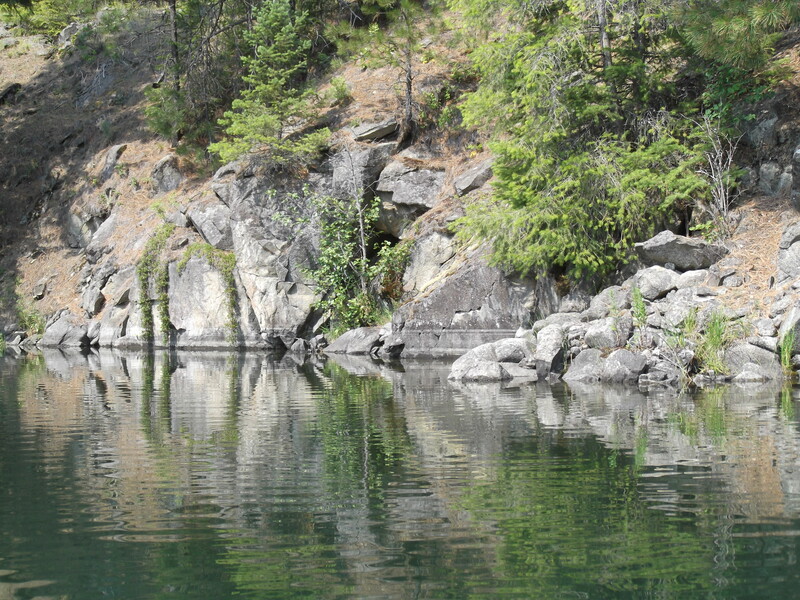 In the area there are rainbow trout, bull trout, kokanee, walleye, sturgeon and cutthroat trout. Spring and early summer it is lush and green here. By late summer things are pretty dried out, and in the fall we get a rich palette of colours. Nelson has some of the cleanest air in the world; it is an area of thick forests, big lakes and many mountains. However, things are changing here as everywhere else; people are coming together to try to increase the declining stock of Gerard trout and Kokanee in Kootenay Lake, where people come from far and wide to fish. One problem is with the rock snot algae (yes, that’s the actual popular name, in other terms: didymosphenia geminata) which affects O2 levels in the fish habitat. This algae has proliferated due to warmer temperatures. Potentially it can grow to cover 75% of the bottom of a body of water. The white sturgeon in the area is an endangered species; this fish can grow to be six meters long and live 80 to 100 years. Bat species in BC are declining due to disease, and there are local bat counts. As bats feed on mice, there is a noticeable increase in mice populations. There are grizzly bear, but not right where I live; two former co-workers who live on the other side of the river, just outside Nelson get visited by them once in awhile. Each of them had animals killed by grizzlies, and one of them, on her bike, met a mother grizzly and cubs on the road. Some years ago the area was infested with the pine beetle and it was eerie to see patches of forest where the pines turned a deep rust colour and then fell to the ground. This was due to a succession of warmer winters, as most of the beetles would be killed off in colder weather. Eventually the beetles ate themselves out of a habitat and moved on. In the East Kootenays larger areas were affected. Now one does not see very many of the dead trees. Another thing of note that has been at issue for many years now in the East Kootenays is that the BC Government gave permission for a business to build a ski and summer mountain resort in one of the most beautiful and pristine areas, which happens to be important grizzly habitat. This of course has been opposed by those of us whose connection with Nature and Her wonders makes it difficult for us to comprehend such intentions. The solution to this conflict is yet to come; the would-be developer is not moving fast, and the opposing parties have law-suits in the works and other ways of gathering recognition and support. What is really amazing is that the BC Govt. gave the site municipality status and it even has a mayor: no residents, and the “city” gets money annually from the govt. One of the legal cases challenges this. I have had my kayak for six years and I keep it down by the river in a falling-down boathouse built years ago by a fellow who lived nearby. A couple neighbors and I keep several kayaks and two canoes in there. The swallows who make nests there in summer leave their droppings on the ground and the boats. These barn swallow populations have been decreasing in BC, and right here is one of the places we are watching and trying to help them flourish. 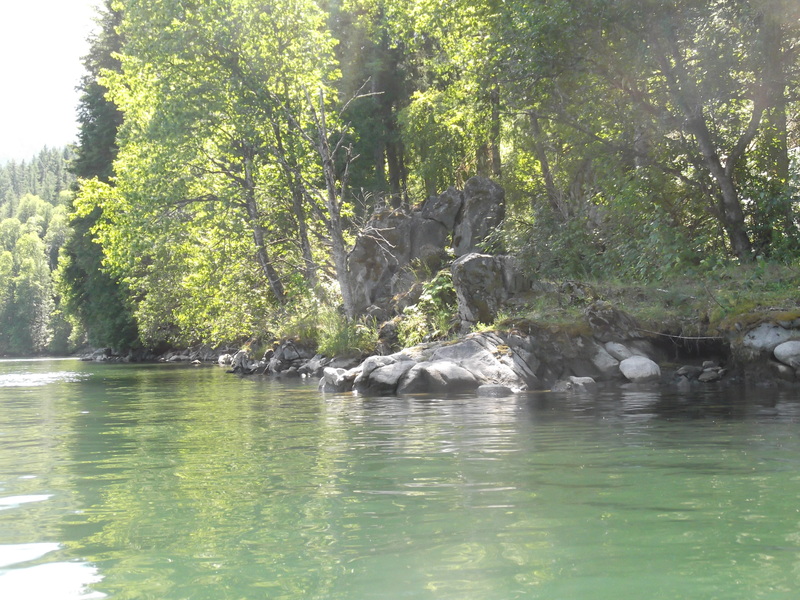 At 70 I’m not so strong as in younger days, and because the kayak is not a sea kayak, the current is too strong from the spring runoff to go out until early July. Then I go paddling whenever the weather and current look good and I have time. July 10, 2014. I have kayaked daily for the last four days. Today there were shimmering sparklies on the water. I went for a dip in the water down between the two shallow islands to the east. Saw a heron and a small eagle, ducks, geese, shore birds all singing… Paradise! When the wind is against me it can be a struggle paddling, but no matter. It is as if I have to be here, with nothing but the water under me, the sky above, the water and bird sounds, warm sun on my skin. I love the sensation of moving, rocking on the buoyant water by paddle power and current or wind. July 31. It has been really hot, and I have been in the kayak most days. Today and a couple days ago I paddled on the south side, where the rocks and trees come right up to the water and the shade is heavy. No roads, no cars, and a long stretch with no houses. The eagles nest in that area, before river farm. Today two eagles were making a lot of noise there, and I think I heard their young ones too. So great! Today when I got back near the shed the Great Blue Heron was there, and then flew on. The osprey are also around. 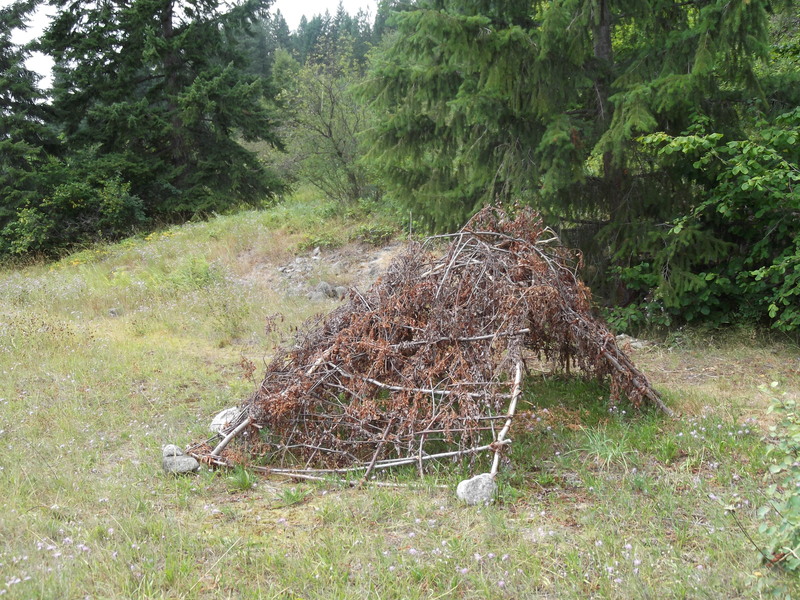 When I walk down to the river, once I cross the railroad tracks and start going to the boat shed I pass the dry woven branches of an old sweat lodge built there one year by a Metis woman I know. Nice to be reminded of her as I pass by it. The heat rocks are still there. The woman who built it took me years ago to a place where she learned from her grandfather to find good rocks for the steam in the lodge. I felt quite honoured to have been on that excursion. There are abundant saskatoon berries down by the boat shed so I take my fill before I go out on the water and when I return. Once in awhile I run into a garter snake on the way down the trail, and sometimes I’ll see a snake in the water as I put the kayak in. The first summer here I came across a black bear munching on thimbleberries as I went down the hill to swim at the river. She looked at me, and I looked at her, and then I went on. There have been years I’ve taken bear spray with me when I go on the trail. A couple of years there were mamma and cub bears hanging out by the railway. One time as I was coming back from the water a mamma and two baby cubs were one the track up ahead. I don’t think they saw me. I just hesitated and then walked on the tracks. Aug. 5. I have really been enjoying blazing the trail down parallel to the tracks so I hardly have to walk on the track at all when going to and from the kayak shed. It has been a lot of work, and I sweated at times. Mostly it was hacking down thimble berry bushes, which get to about my height or higher. But also small trees and branches, ferns, Oregon grape, a few sticky roses. The trail down from my yard I clear out in the spring; it is very steep so I use a hiking pole to get down, and near the steep part at top there is a wire I also hang onto. I have slipped and fallen couple times, but never hurt myself. Where the new trail comes out near the tracks there are little alder trees and big rocks, and with the trail cleared it is quite pretty in the sun. My body and mind feel very good after having worked on the trail. It is surprising what a sense of accomplishment it gave me. I know it will be used a lot by the bears, but that is OK. This afternoon was crazy kayaking—as I hiked down I first heard the fire bomber planes. I had no idea that the four of them would be coming here to pick up water for hours, right where I kayak. So I went out not knowing that the noise would be way too much. What a deal! They were taking the water to a dangerous fire at Slocan Park, not that far from here in a straight line. It was scary, as they kept coming down on the water and I would seem to be right in their path, but somehow we did not collide. The noise really scared a duck, which flew away. At one point I saw a heron which was right in the path of one of the planes, and it had to veer quickly off to be out of the way. I really could not stand the noise. Aug. 10. I am still kayaking most days—just beautiful. Today was hot and I dipped in the water three times. I don’t really swim, but get all my body in the water and do a few strokes. This time of year the water is cool yet warm enough for a comfortable swim. As I returned and drew near the shore today I was thinking about people close to me who have died. I wished I could have gone to my Aunt Mae’s memorial a few years ago. She was an amazing person—my late mother’s eldest sister—mountain climber, school teacher, peace-worker, community-minded woman who raised four children on her own after her husband died. But the memorial was in southern California in the winter—too hard to get to from here. Then as I pulled in my neighbor L. was lying on the grass in the sun. I asked her about her sister, whom I’d known in a drumming group I was in thirteen years ago. And she told me her sister had been dead ten years! I was very sad to hear that; she and I had had brief but nice contacts and I had never heard about her death. Then as I pulled on my backpack and started back home with my hiking stick it seemed as if I was walking with many precious souls with me who have gone beyond—more and more often they are with me. Always my mother and father and my mom’s mother. Tears often come to my eyes—not just for missing for them, but also for Earth, this delicate habitat I see dying to its own nature before my eyes. Mentioning my aunt Mae brings up my love of hiking in the mountains. Mae and my mother’s elder brother Rex climbed in the Cascades in the US back in the 1930’s. Rex climbed with others who were active in the Seattle Mountaineers. My own favorite place to be, along with Slocan Lake, is up in the alpine. In the days when I could heft an overnight pack I was fortunate to visit many wonderful hikes in the Canadian Rockies, the Olympics in WA, and here our Selkirk Mountains, and also to do day hikes. There is something thrilling to me to be high up, to smell the glacial snow, hear the rushing cascades, and to hike as I breathe in the scent of alpine spruce; this is where I feel truly at home. I am sure Mae and Rex must have had similar experiences. Two of my cousins, Mae’s sons, are climbers; one lives in the Wyoming Rockies. My uncle Rex was in one of the most devastating avalanches on Mt. Baker when climbing there in 1939. He and his first wife were on the annual climb arranged by the college at Bellingham. It was July 22nd, and Rex had already attained the summit that day. There were 25 students and faculty on the trip. As they came down at Deming Glacier a huge avalanche rushed down on all of them. They were shouting at each other giving instructions of what to do. The forest ranger’s report written afterward mentioned survivors said they saw people under, then above the snow “as though they were pieces of driftwood being carried over rapids.” Rex and his wife were among those who were not buried. He and one other female climber made a very fast dash down the mountain for about ten miles, to inform the ranger. A search party was formed and they headed back to a cabin which fortunately had some supplies, or they would have had to take up heavier loads. They found one woman alive, who had been clinging to a ledge by her fingers. Two of the dead were found. The search went on some days even though it was quite dangerous at the location. There had been 19 survivors. I think I heard about enough avalanche deaths in my younger days to influence me to be a hiker, not really a climber. Aug. 11. The day of birds and animals. In numerology this day has the number 9, very special to me, and also the number of the Great Mother in Celtic traditions. I set out paddling across the river and west, toward river farm. I noticed a beaver out swimming not too far from me, and watched it as it went under, and then came back up in a different place. 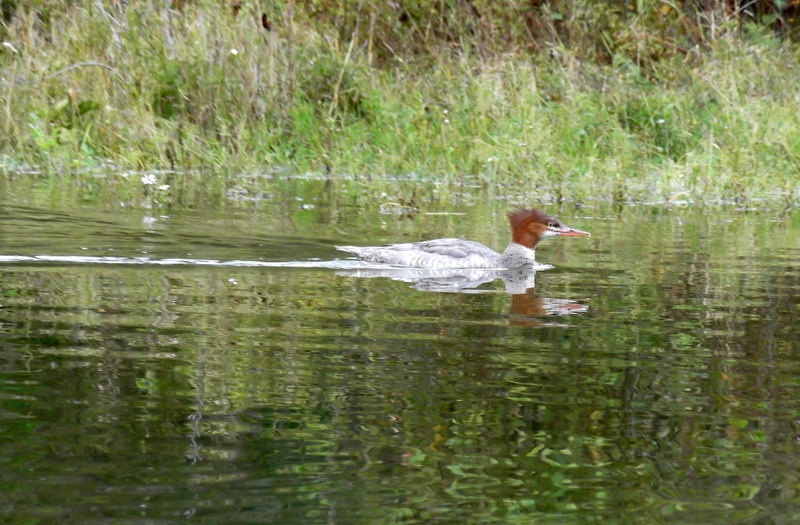 It flapped its tail a couple times, and eventually swam to its lodge, I suppose. On that side there are two big beaver lodges, maybe one is inhabited now. 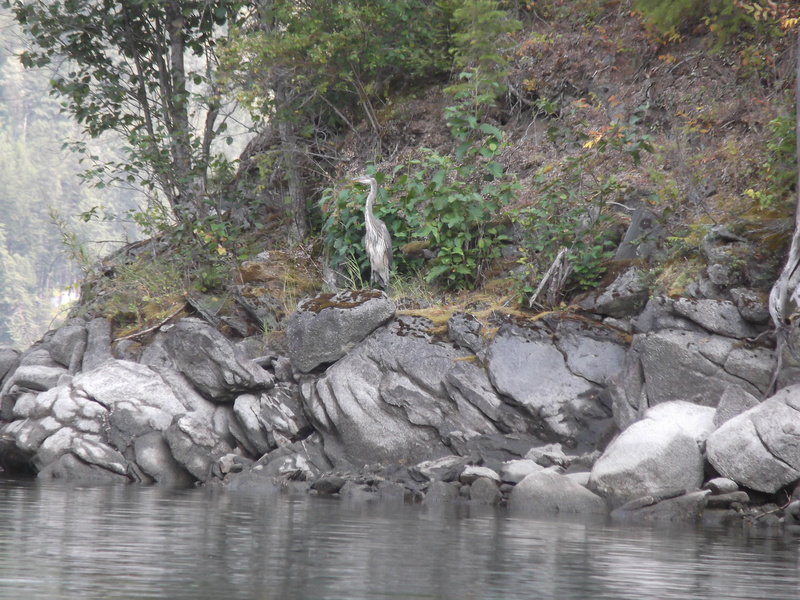 Then further along I paddled right up near a heron waiting on a cliff looking for a fish to catch. I assumed it would fly away as I approached, but it could have cared less about me. So I got my camera out and got in position to take several pictures. The heron looked just like a whitened piece of wood jutting up from the ground. When I was paddling back, not far past where the heron had been there was a young buck which had come down to drink in the river. 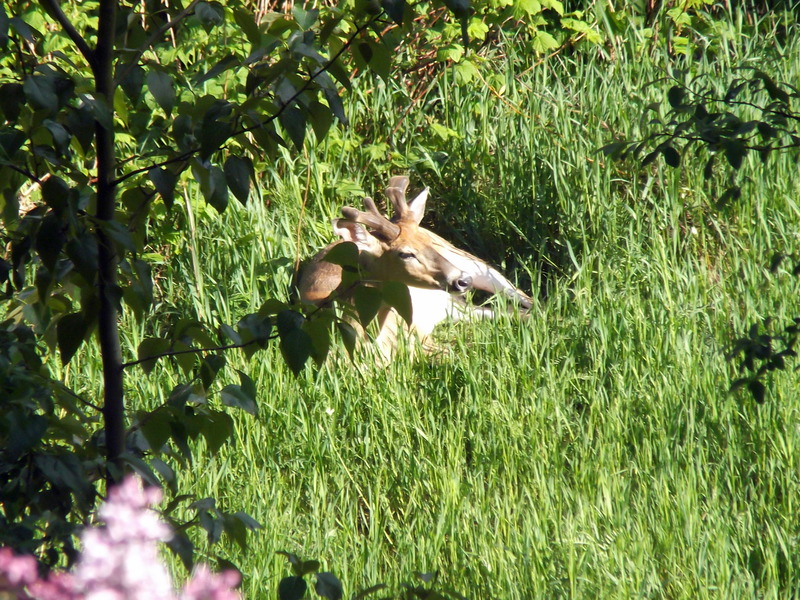 Again I was surprised as he was there long enough for me to get a picture; then he bounded up the hill into the trees. 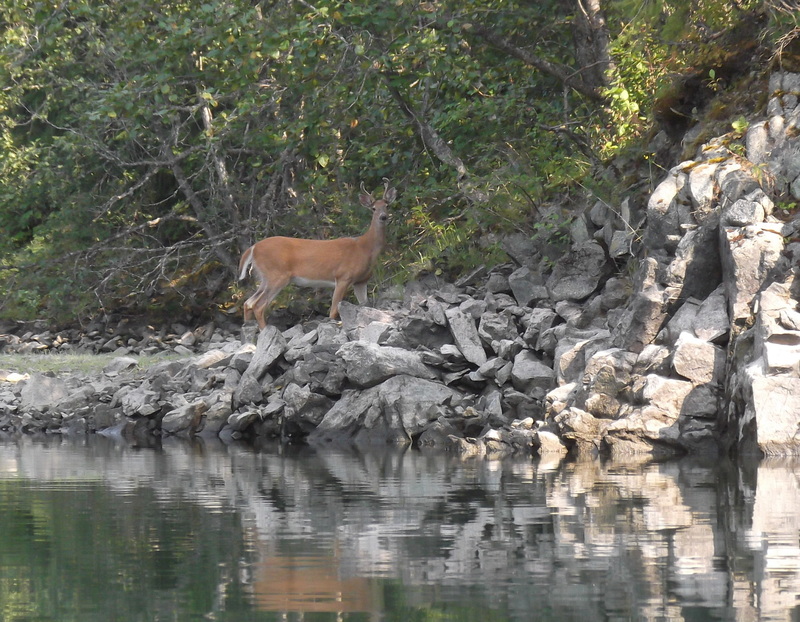 It was a great sight—the buck against the green of trees, the river and rocks in the front. When I took the kayak in and was sitting drying my feet off, there was a little swallow hopping around. I thought to myself, that must be the one which L. told me the bigger swallows were kicking out of the nest. It must have learned to fly, as then it was no longer there. Another way this day was very special was that two zikr tunes came to me—one before kayaking, and one after. That is certainly a first. Aug. 18th. This day I had the pleasure of paddling a sea kayak on the West Arm of Kootenay Lake. A woman in our dance circle won a day of free kayaking for two people, so we started out fairly early by the bridge in Nelson, with our water bottles, sun hats, and some food. It was sunny and a bit windy. We stopped to eat and swim and enjoy the sun at a place I didn’t know existed—a Provincial Park accessible only by boat. It was very pleasant there. The beach was sandy; no one else was around. We had great swims. It was beautiful with the big rocks, and view up the lake to the NE. On the way back we were paddling against the wind but we made it just in time to turn the boats back to the shop people. Sept. 7. Sunday. On Thurs. I went to my sacred place to camp at Slocan Lake. I am so glad I did. I have been going there for seventeen years now. I used to go twice in a summer, now just once. I have missed only two years. As I’d need another person and a lot of preparation, I didn’t take the kayak. So I find at my age now it is a bit harder walking everywhere on the beach rocks. But my times at my morning beach were just perfect. There were usually no people around, so I could take a “bath” and skinny-dip. And I was able to ford the water where the creek comes out, using two poles and my beach sandals. That felt very good. 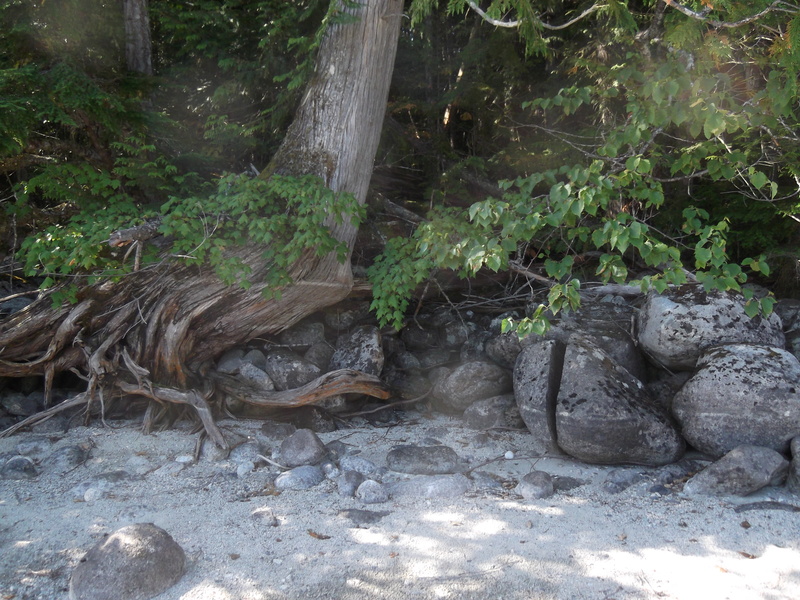 There are very huge smooth rocks there around and in the creek mouth. 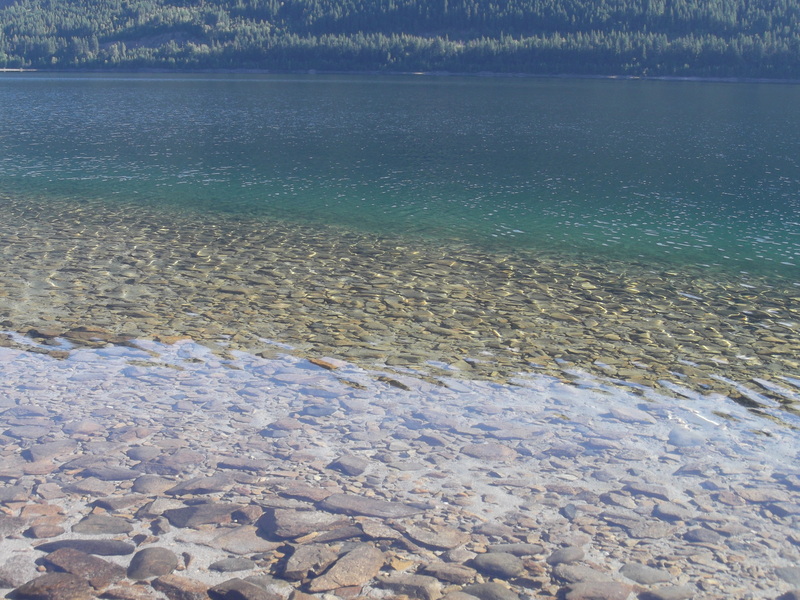 The water in this lake is clear and clean enough to drink. At the shallow beaches one can see the shadow of ripples with sun, playing on the sand and pebbles; I find it mesmerizing. During WWII when the Canadian government interned over 22,000 Japanese Canadians in camps, many were brought to communities on this lake. David Suzuki lived in one of those oppressive camps as a boy. It seems a bit ironic that those of Japanese heritage were brought then to this place which is, actually, a paradise. And Suzuki was able to appreciate that, at least. Now there is the Nikkei Internment Memorial Centre in New Denver, which tells the story of these people, and is a lovely peaceful place to commemorate them. I played mandolin by my campfire one night. This is my place of pilgrimage, and I feel so blessed to be able to go to this beauteous lake in the mountains, to hear the loon, and this time there was a great horned owl—to hear the rumbling creek, smell the woods, be by the lapping water. I used to go before dance camp and at my morning beach in the sand, I’d dance the dances I’d offer at camp. This time I danced dances for our regular sessions. I dance on the warm sand, barefoot in the sun, with the slim shadows of aspen, with the sparkling on the water and stretches of blue mountains in every direction, the constant music of the creek. I sometimes think of my parents and the cabin they built on Hood Canal in WA, as that place was for them the way Slocan Lake is for me. It was even about the same distance of a drive from their Seattle home. They were able to spend most of six months a year there after Dad retired. Mom died one year and four months ago, and I miss her greatly. Her favorite thing was walking on the beach at the Canal with the salt water, gulls, big cedar and fir trees, with the snow-covered Olympic mountains in view. And she loved to swim in the water there. Once a seal came up to her and she was swimming alongside it a bit. I later had a dream that a seal was holding me swimming in the water. I made a drawing from that. My parents had a crab pot and Dad would go out in his dinghy and get the crabs. They could pick up oysters right off the beach and dig clams with their hands. They made an outdoor fireplace where they cooked oysters on the half-shell. On clear nights Dad would sleep outside there, and so did I when I visited. It was lovely before dawn when I’d wake up as the stars would fade and the eastern sky would be a dark red-orange. Then the birds would start their chorus and the mountains would be shadows against the western sky. I know all these were my parents’ sacred things as are the lake and river and mountains here, for me. One sad note about Hood Canal is that the Trident submarine base was built there, in this most beautiful and serene part of western Washington. On one of my mother’s beach walks she found a spent torpedo! The Navy actually gave her $50 for returning it. And my parents found two paddles on the beach, of a gray military colour. I later had these paddles and stripped the paint off them and then painted salmon motifs based on Native NW Coast art. They were the first paddles my former partner and I used with the cedar strip and fiberglass canoe we built. So I was happy with this, as I figured I had de-militarized the paddles. Today as I was ready to get out of bed the ravens were on the roof again and making all kinds of noise! This time of year they do that to get a good take-off place for getting the elderberries below the house. I cannot reach the berries as they are on the steep hill. A few years back I took my backpack and kayaked across the river to a place where there are a lot of elderberry trees I can get to. I picked a couple bags of the berries, went back to the other shore and then carried the berries on my back to the house. I then made elderberry tincture with them—something I was inspired to do by my sufi guide, Noor-un-Nisa Joan Walsh. I still have quite a bit of the tincture left. As I went down the path to kayak a big rescue helicopter came by and the noise was madness to my poor ears. The sun was out, a lovely day. And then out on the water another big noise, like back-up beep of a big truck, but it was the large yellow rescue boat coming toward me in. A fellow yelled “hello,” and told me they were searching for a missing man. He said if you see anything don’t approach, just notify the police. So I assured him I’d do that. A weird thing to happen out there in the peaceful waters. Later I heard that a man camping east of Nelson had gone missing. Another year when I was out in the kayak I heard sirens which seemed to stop not far to the west on the highway which parallels the river. Sadly, that had been a car accident in which a young woman was killed. So I have had this strange juxtaposition of the beauty and majesty of my river time, mixed in with emergencies, death, sirens. Sept. 15. Many of the birch trees on my place and others here have been killed off by a beetle infestation. The trees need a lot of water, and the beetles gained in numbers after a couple very hot dry summers. Eventually the tops of the birches fall off and slowly, piece by piece, the rest of the tree. When I walk on the trail I see the stark white remains, like pillars ready to fall. At the bottom of the hill there are three birch trunks standing upright, and on one there are huge shelf fungi growing. This is near a place where for years I have scented what seems to me like honey. Having raised honeybees in my younger days, I like to imagine there are hidden bees making honey at this place, yet a bear would have found that years ago. I wonder what makes that scent. This place is also where I fantasize there was a Native pit house, as there always has been a big depression in the ground right there, and it would have been up away from the river in those days. The Natives pit houses here worked very well, with natural heat and protection in winter, and cooling in summer. The missing man they had been searching for last week was found dead near where he had camped. Today L. and I skinny-dipped in the water by the shed. When there are not boats about, or someone right across the river, this is a very good place to skinny-dip, as it cannot be seen from neighbors’ places, nor from across the river. When I lie in the sun after getting in the water I feel just wonderful—really like I did as a girl doing this. Everything falls away, I am held by Mother Earth, solid beneath me, stroked by the sun; I hear the water lapping on the sand and rocks, and feel my skin drying. My body seems pleasantly heavy in a letting-go kind of way. Lying face-down with the sensation of sinking into Earth, I breathe out and it is as if Gaia takes in any stress or bother from my mind and body and each breath leaves me more and more relaxed and free. Sept. 16. We are still having beautiful weather. I kayaked again. There were hundreds of little silver fish leaping to the surface of the water. I got in the water and lay in the sun amid the grass and rose thorns and knapweed, but it is wonderful. Where the boat shed is, the view out to the SW is quite lovely. This is just before the river curves a bit, and this curve one can see on a map. Just past the shed is where a rushing creek comes out. This area was where the Native people camped and set up their fish nets. Then, before the dams, the river was about a third as wide as it is now when it is low. I have been swimming and enjoying that place since I first moved to this house. It is very special to know the First Peoples enjoyed this same place. For some years now I am the only one who visits it. Sept. 20. Today I paddled east and across the river. In this direction there are many rock formations, and in the trees a place where I often hear what sounds like frogs. On a rock that sticks up out of the water a merganser was standing and beautifully reflected in the water, sort of bobbing up and down. Too cold to swim now. Sept. 21. Paddled today and a great heron flew in front of me. Sept. 22. Today I paddled west and a big bald eagle was roaming on the shore at the old Native campsite. Later when I played a guitar piece of mine (with a bird theme) a small bird outside kept chirping as if in a duet with my playing. I had the feeling it would stop when the song ended, and it did. Sept. 29. After going out paddling I was coming up the trail to the house and there was a big shiny black raven which had been injured. He was limping but could not fly. His one eye looked right at me, and I stopped walking. I just looked at him and tried to make comforting noises as he slowly went off the trail. I sent him some compassion and healing. But I wished I could have put him in a safe place and fed him with the hope he would heal. Right here where I live there have been deer killed on the highway. One time it was winter and beside the dead deer was the imprint of a raven’s wing in the snow, beneath a blue sky. Some years ago a female elk was hit by my house and she limped her way down to the river and was dying there. I called the conservation officer and he came out to kill her mercifully. Oct. 3. Today when I started down the trail a bunch of ravens were making a whole lot of noise. I don’t know if ravens eat their own dead, and wanted them not to be devouring the one I saw. Out on the water was a very wonderful experience today. Big fish were jumping along with little ones. I saw a bald eagle. After I got home I heard a loon. It is as if in summer here is a world, and now early fall is a world, and I am largely alone and very much at peace with these worlds made by the seasons in turn. The beauty of the colours, the slight breeze over the river, the last tomatoes on the vine, some green. I love the smell of the tomato plants. I love the taste of green tomatoes and am freezing them. I feel so blessed to have spent these past eighteen years living here, surrounded by Mother Nature’s astounding beauty, the healing peace. And this gratitude now exists side by side with the gnawing at my stomach, that aching so deep for the human wrecking ball chipping away at the ecosystems, the balances, the physical and biological processes humans have disturbed. ..and what that has left us and all Earth, all life, to lose. This grief became overwhelming to me, and I looked to my sufi path and guidance which supports me to exist in this present world. As a friend Kalama, in WA says, if this is the end of all we are, then let us at least live through it as “real humans.” Our species now has just two years in which to start making drastic changes which may turn around some of the destructive forces put into place. In a way, my many years of hungering to live in the distant past on this turtle Island forms a part of my vision for what can happen now: the creation of a different world. It is amazing how many young people today are putting so much effort into making the needed changes, and with eagerness. 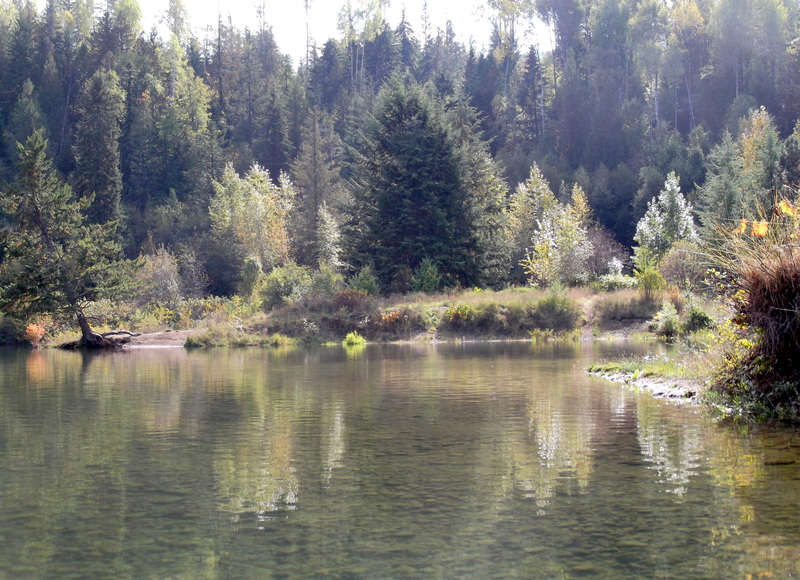 When I was growing up in the mid-1900s, much of North America was an unspoiled paradise. I cannot imagine what it would be to be young in these times, with much of this disappearing before our eyes. Oct. 5. This is two days before the full moon. At sunset the sky was all aglow with an unearthly golden and orange-red glow illuminating everything including the brilliant fall colours. It was truly amazing. I gazed from the house looking down on the river and the low mountains that come down to it—trees, water, and sky. Oct. 16. I was looking out from the house on the reflection of the autumn colours in the river and thought how I am hoping for one more paddle before the cold weather. The fall has been just wonderful, but rather warmer than usual. Still no frost here, which is very unusual. Oct. 21. Wrapping up. Finally today that chance for paddling came. Being busy with little tasks in the morning, I missed the sunny time of day. I took my mountain backpack down with me to bring things back up. The trail was slippery after rain last night. Clouds from NE Washington were pushing up and robbing us of much of the sun. The water was pretty calm when I went out, with just a bit of wind from the SW. I took my rain jacket along; I was surprised at how warm the water felt on my feet when I pushed out. I went west at first in the sun, and then in sun with a bit of misty rain starting. Then less sun. After more rain and more wind and bigger waves, I decided to put the rain jacket on over the life jacket: not an easy task—I got one arm in and then the waves would start whipping the boat toward the rocks so I’d paddle away, then try again and finally I got the jacket on. The ride was pleasant, with the calm that autumn brings, and the array of colours—a bright yellow-green, orange, yellow orange, yellow, red, orange red. All of it demanding my attention and awe. It is a strange feeling to know that in this several mile stretch of the river I am the human who has been out on the river the most this year, probably last year too. It lends a special feeling of belonging and being at one with the elements, the ancestors who lived here for thousands of years, the rocks, the mountains. When I got back to the shed I fastened my funky cover over the cockpit and put the life jacket and beach towel in my pack. I looked out at the shimmering sheet of waves brightening the river surface. 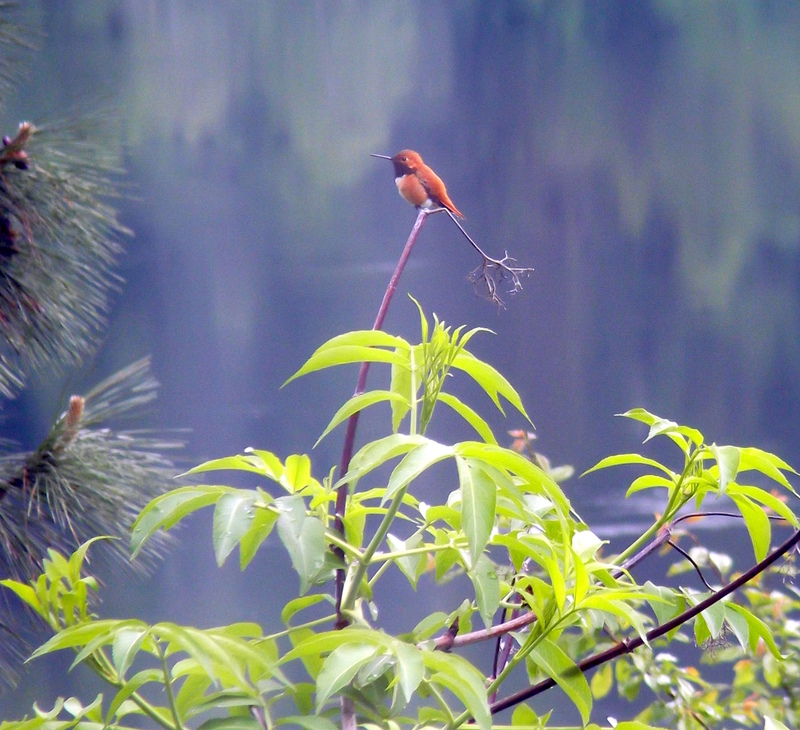 As I walked toward the railroad tracks a great many rust-orange ferns were standing as high as my shoulders, my eyes. I offered appreciation to the old dry branches of the sweat lodge. When I’d gotten part way up the hill to my place the sun came out and the golden leaves glowed. Now again as I write this the sun is bursting out and showing off the blazing colours. One cannot begin to describe them, and I certainly shall not try. The world needs your voice, dear sister Khabira, and your keen eye. And your casually profound way with words. Thank you so much; I am new to this way of communicating, so it’s great to have encouragement. I am so glad I discovered your writing. I couldn’t skim, I just settled in and read all of the Kayak Papers of 2014!! It makes me miss you so much, and appreciate your solitude and love of nature. Thank you!